Here is the instruction to help you fast copy main movie only from a DVD disc without any quality loss and extra to take up space. Usually, a DVD movie contains several parts such as, main movie, trailer, ads, footage and other parts. Before you watch the main movie from your DVD disc, you take time to watch lots of ads and commercials. For anybody who want to copy and watch DVD main movie only, you're in the right place. The rest of the article will show you how to do and please follow me. To copy and watch DVD main movie only, you just need some help from a professional DVD Ripper to help you cut off the extra parts. Brorsoft DVD Ripper is the your best choice without doubt. 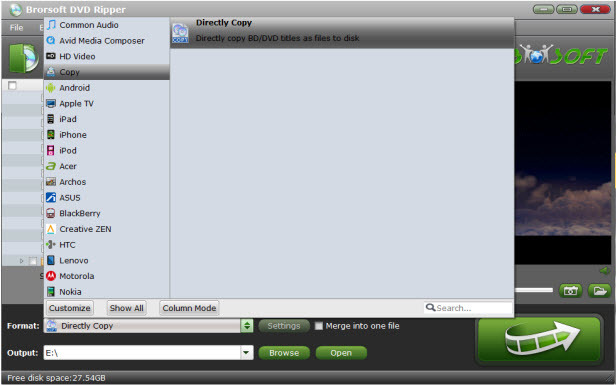 With it, you can copy DVD main movie only and leave out unwanted menus or other extras. Beside, the program can help you rip DVD discs to any format you want or any devices (iPad, iPhone, Apple TV, Xbox, PS3, Android tablets and phones, etc) with optimized video formats. Plus, the program also has a bulit-in-editor to help you cut the movie length, crop DVD movie black edge, add personal watermark to DVD movie, adjust output video effects as you like. For Mac users, kindly turn to Brorsoft DVD Ripper for Mac. Now download the free trial program and start to backup DVD main movie only. The trail-before-purchase version available for you, Windows version screenshots were taken as example, the Mac version shares the same steps. Just keep in mind you have download the right version, Windows platform .exe files cannot be installed on macOS – and vice versa. Guide: How to Copy and watch DVD Main Movie Only? Install and run the DVD ripper, click "Load disc" button to load your DVD movies to the program. Tip: You can also click “IFO/ISO” icon to load your DVD IFO files and ISO image files. Finally, click "Convert" button to backup DVD main movie only. When the conversion is finished, you are able to click "Open" button to locate the output . vob files without extra contents. Now you can watch DVD main movie with your families and friend on your HDTV without any hassle. And you can also use Video ultimate to copy Blu-ray/DVD or videos main movie only for watching on HDTV without limitations.